Meet your guide and driver at our central meeting point the Heineken Experience Amsterdam. A comfortable, air-conditioned luxurious minivan will take you to today’s first destination in about 90 minutes; Rotterdam. Rotterdam is the second largest city in the Netherlands and quite famous for its commercial harbor. First stop is Spido for your 75-minute boat tour, the best way to view one of one of the world’s largest ports. 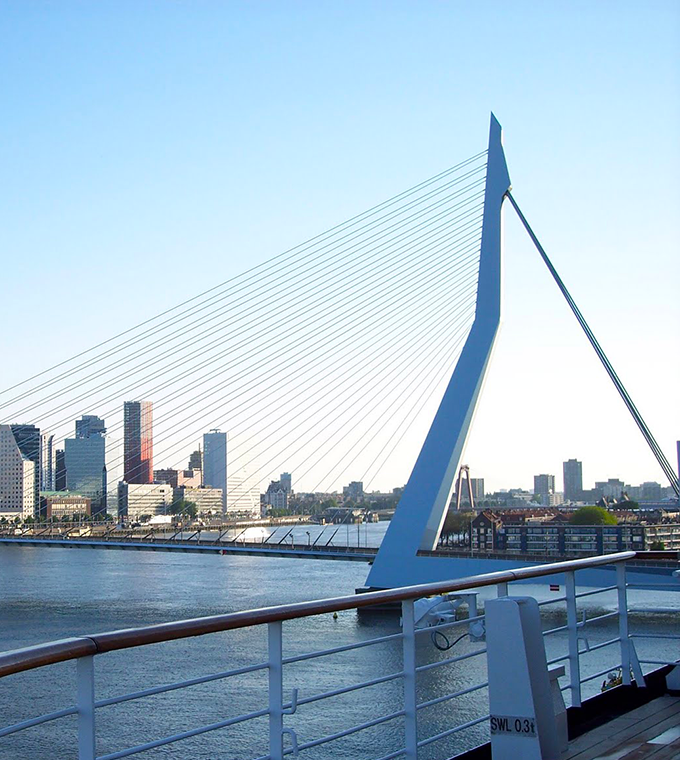 You’ll see Rotterdam’s imposing skyline, cutting-edge architecture, harbors, shipyards, and docks. Next stop is the picturesque city of Delft, birth and final resting place of Dutch master Johannes Vermeer. Known as the Princes’ city, it is also where countless members of the Dutch royal family have moved, married, and been buried for centuries. Visit Delft’s canal-streaked historic town centre, packed with awe-inspiring historical monuments including the Old Church, the New Church, and the town hall. While there, you will visit De Delftse Pauw, a factory specializing in handmade Delft Blue pottery, the most coveted porcelain since the 17th century. Next is the city of The Hague. In addition to being the seat of the Dutch government, this city is also the home of the Dutch royal family and the third largest city in the country. The Hague is where most foreign embassies in the Netherlands are located, as well as 150 international organizations, including the International Court of Justice and the International Criminal Court. It is also the home of the Peace Palace, a number of royal palaces, the Mauritshuis (featuring work by Vermeer, Rembrandt, and Andy Warhol, among others), and the Binnenhof (the Dutch parliament). Transfer back to Amsterdam for the end of tour services, and a better appreciation of life outside the cultural capital. • Please make sure you arrive well in time at your chosen starting point. 9 am, at Heineken Experience, Stadhouderskade 78, Amsterdam.